Every now and then you stumble across a company on the internet that is selling, and doing, something truly special. Imagine someone capturing a stage in your life, an occasion, an emotion, a message.... and turning it into a song. A completely personalised and unique piece of music. Imagine giving that as a gift to someone. Wow! This is what Songfinch, and their supremely talented team of musicians, do for you. And they do it professionally, whizzily quickly, mind blowingly awesomely, and in a way that makes you feel like you are their number one client. And the process is really easy. 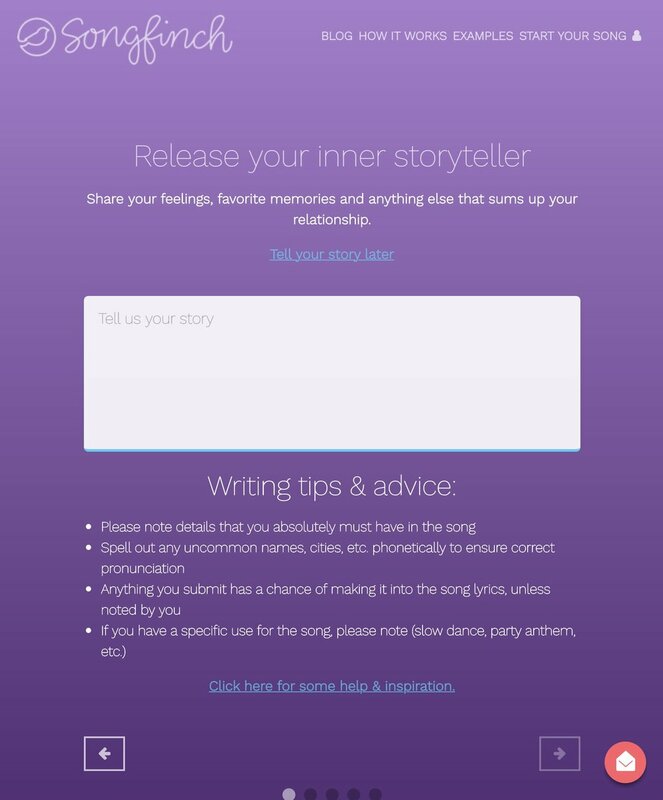 You tell them your story by filling in their simple website forms, and within 7 days your song will be delivered. You give Songfinch your story.... and Songfinch deliver you a completely unique and personalised song. The process is simple and straightforward. You can choose the genre, the mood, and the gender of the artist for your song. I chose Singer/Songwriter, happy vibe, and a surprise for the singer. The Songfinch website is a great portal to what they do. It is really easy to navigate at every step of the process, and the blog page answers every conceivable question - creative or techy - that you may have. And finally, because our Paris adventure is coming to an end, I wanted to use it to reveal to you, and my family and friends, the location of our next family move. I went through the Songfinch process on a Monday. I took the time to sit down and really think about what the purpose of the song was for me and the detail that I wanted to go into it. I highly recommend you do the same. At every step along the creative process, I was kept informed with delightfully friendily and informative emails from Songfinch. They were perfectly pitched. On Friday evening, it arrived. I was nervous before I listened to my song. The email from Songfinch suggested I listen to it a few times; to really hear the words and how my story had been cleverly intertwined into all the lyrics. On my first listen I had a lump in my throat. The second time I listened to it, with my husband, my eyes may have leaked a little. I promise I am not exaggerating. (and if you like the song, you can connect with the artist - Grace Freeman - through her social media buttons in the link). So, right to it, what does all this cost? $200 USD (which according to Google is just under £150, or just under €170). Now this may have made you stop and think, wow that’s a lot. It did me to start with... BUT honestly this is unique, and having received my song I firmly believe it is worth it. You could make it a special or a joint present for someone, or like me, treat and spoil yourself and/or your family to something that you will cherish forever. I have listened to my Songfinch song countless times already. I have found myself humming it and singing lines. I've even had a dance to it with my 2 year old! We all love it. It will be cherished for a very long time. ..... It's worth every penny. Choose to do something beautiful. I am confident you won’t regret it. And if you use this discount code: 5LITTLESTARS you will get $20 off your own wonderful song (valid until October 2018). P.s. I was gifted this Songfinch song for the purposes of a review. My views above are, as always, honest and my own.